It’s no fun to have a cat pooping on the floor, especially if your cat is suddenly pooping on the floor. This frustrating problem can often be solved by changing your litterbox setup and ensuring that your cat is physically healthy and happy. If you’re still having kitty litter box problems, sign up for 1 month of unlimited email/text support. I’ll help you create a plan and troubleshoot – and you can text/email me whenever you need extra help! Any thoughts on how to break Panda, my 17-year-old cat, of peeing and crapping outside his litter boxes? He used to crap under the oil tank but now he is starting to use other places in the basement. I’ve been cleaning his litter box more often, but now he won’t use his covered box at all! How long has your cat been pooping on the floor in the basement? If this is a sudden change, it’s extra-important to get him to the vet for a checkup. How often does he not use the boxes? Does he skip the box once a week when it’s super dirty? Or does he avoid the boxes all the time? Does anything happen right before he stops using the boxes? For example, does he stop using his litterbox after guests visit? Is his poo extra stinky? If so, you might want to change his food and get a vet checkup to ensure that there isn’t a medical problem. If you’re still having kitty litter box problems, get help with me through a phone call or via text/email support. Come prepared with the answers to the questions above! In order to know which of these problems is plaguing Panda, the first stop should be the vet’s office. Even though Panda is both peeing and pooping on the floor, we need to rule out a UTI or more serious medical concern as the first step. Tell your vet what’s been going on with the box and they’ll run the right tests. Let’s go through the options. It won’t hurt to try each of these options to help your cat use the litterbox again. Keep in mind that fixing a medical problem and reducing your cat’s stress need to be your #1 priority. The cleanest boxes in the world won’t help if your cat has a UTI! Even if your 16 year old won’t play like a kitten, he’ll enjoy watching the toys! Depending on where he’s peeing and pooping, a good short-term solution is to block off the areas he’s using as an alternate box. Closing him into a small area (like a bathroom) with his box can also help kickstart litterbox habits. If your cat already has a bad association with the old box, you might be best off trying a new box. If your current boxes are deep and covered, try a shallow box in another area of the basement. 3. Super-clean the offending spaces. Get something like Eco 88 or Nature’s Miracle and a blacklight. Go through the house and find all of your cat’s old accidents and clean the crap out of them. 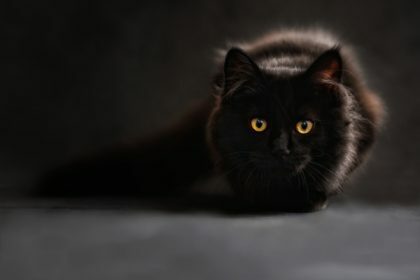 If your cat smells old urine or feces in a corner of the basement, he might think it’s a good idea to pee there again. So clean it really well using a cleaner that’s made for pet urine! 5. Increase your cat’s daily mental enrichment. This could mean playing music when you’re at work, giving him some daily play sessions with a good wand toy (even if he just watches it), giving him daily treats through a puzzle toy or just spending more time with him. All of this will help reduce his stress level. Remember, stress is often the root of litterbox issues! 6. Clean the boxes more. Many cats simply won’t use a dirty box. 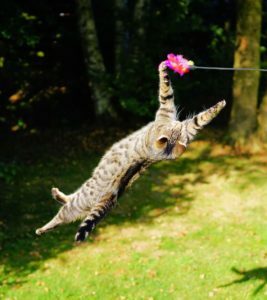 Even if your cat has always been a trooper about getting his paws dirty, he might be getting picky in old age. Try to scoop the box daily or even twice daily. 7. Try a Feliway diffuser. Again, this stuff seems like voodoo stuff – but Feliway can really help in some cases. It’s a calming pheromone that you can put into a wall diffuser or use as a spray. I know plenty of people who swear by it. As far as I can tell, it can’t hurt. Unfortunately, there’s not much of a training quick fix when it comes to your cat pooping on the floor. Make sure that the litterbox issues aren’t medical. Then your best bet is to improve litterbox setup and decrease stress levels. There are some diffusers and other products that can help, but alone they’re unlikely to solve the problem. 8. Add Cat Attract to the litterboxes. This little product is made to help remind cats to use their box. There’s frustratingly little information about what’s in Cat Attract or why it works. The website just says that it’s natural, they tested it, it works, buy it. I’d be skeptical, but… we use it at the shelter and I know several people who swear it makes a difference. Can’t hurt to try. There are many things leading to a cat pooping on the floor. Let’s run through some common scenarios. Remember, it’s possible that Panda is suffering from several of these. Luckily the solutions are similar for all of them! 1. Your cat is sick. If he’s got a UTI, urinating might be painful. He might learn that peeing inside the box hurts, so he tries peeing elsewhere to see if that helps. Given his age, it’s a good idea to check with the vet to rule out other serious medical concerns. No matter what you do for his behavioral health, we can’t fix anything if he’s physically unhealthy. 2. Your cat is in pain. When older cats won’t use the litterbox, it could be because they’re in pain. Squatting might hurt, or stepping into the litterbox might be more difficult than it used to be. Sometimes, cats develop a suspicion that the litterbox is causing pain, rather than the fact that it’s their own body that hurts. 3. Your cat is stressed. Many cats don’t deal well with stress. This could relate back to being sick – he might be stressed because his joints ache. Or he could be stressed by something that’s never bothered him before (like the oncoming brutally cold Wisconsin winter). There might be something you’d never notice that’s bugging him – like a raccoon behind the house that’s driving him nuts. Failing litterbox habits are a common symptom of stress. If your cat is pooping on the floor, take a look at what’s new in their life. Cats don’t deal well with change and they’re easily stressed. Many cats start peeing or pooping on the floor due to stress. 4. Your litterboxes aren’t clean enough. As cats age, they might get more particular about their litterbox setup. He might not like that the litterboxes are all the way in the basement. Did you recently change the litter? Just changing the litter type is enough to set some cats off! Some cats like large, shallow boxes; others like deep, small ones. Many cats don’t like covered boxes at all. He might prefer more litter, less litter, a cleaner box, a bigger box, or just unscented powdery litter. Tip: most cats prefer just a half inch of soft, sandy, unscented litter in an uncovered box. Scoop the box daily and dump it weekly! They don’t want yesterday’s poop or last week’s pee on their paws. 5. Your cat’s bladder control just isn’t very good anymore. Given that Panda’s accidents are limited to the basement, I’m skeptical of this one. If he truly had little bladder control, I’d expect him to have accidents throughout the house. But this is a common reason for older cats to stop using the litterbox. Got a cat pooping on the floor? I offer 15-minute consultations to find a solution. I cannot solve your problem in the comments section of this post. All of our cats use the litter box except2. One Male and one female. We clean out the litter box regularly. In the house we have at least 10 cats. Help us please!! Barbie, I’ll shoot you an email. I’d love to help! My Male cat has been pooping in our toddlers bedroom for a few months on and off. His poop smells terrible. Hes a sweet cat who loves snuggles and allows the kids to grab at him all day. Our toddler boy specifically may be upsetting lex (our cat) . He tries to pick him up and tips his fur out ..lex continues to lay around the kids though like he doesnt care at all. Hes not fixed and only about q yearold. He shares 2 liter boxes with 3 other female cats. . I had to rehome my cat of 14 years to my daughrter because of health reasons. She is a high anxiety kitty and only wishes to be around me. She is pooping all over my daughters house and I dont know what to do about the situation and my daughter now doesn’t want her anymore because of this reason. I’m so sorry to hear that, Sherry! It’s always hard to give up our pets, and I’m sure that your daughter is frustrated. Has she seen a vet or gotten any calming treats? That’s always a first step for sudden changes. What else have you tried so far? I’d recommend reducing her space in the house to just a room (bathrooms are easiest to clean) while she adjusts. If you’d like more help, I offer email support and 15-minute or 1-hour phone calls to troubleshoot. We have excellent success with litterbox issues using a combination of the email support and 15-minute calls. I have a 4-5 year old female cat , she’s used the litter box her whole life ! The last 2 days she has been pooping in random places . Everywhere OTHER THAN THE LITTER BOX she’s eating drinking and peeing and pooping . I’m at a loss ? I’m so sorry to hear that, Lauren! It’s so frustrating to have our cats suddenly change their litterbox habits. Has she seen a vet? That’s always a first step for sudden changes. What else have you tried so far? If you’d like more help, I offer email support and 15-minute or 1-hour phone calls to troubleshoot. We have excellent success with litterbox issues using a combination of the email support and 15-minute calls. I have 4 cats and 1 of the females will not use the litter box. She was found after Hurricane Irma last year and we got her from the shelter a few weeks after. I’m assuming by her interactions with the other cats, she was an only cat in a household somewhere. Michele, I’m sorry to hear that you’re struggling with this! Cats that don’t use the litterbox can be really challenging to live with. What have you tried so far to introduce her to the other cats and reduce her stress? If you’d like more help, I offer email support and 15-minute or 1-hour phone calls to troubleshoot. We have excellent success with litterbox issues using a combination of the email support and 15-minute calls. Hi, Cherie. I’m sorry to hear that you’re having problems with your cat’s litterbox habits. So frustrating! I’d start by confining your kitty to a smaller space (like a bathroom). Use some Feliway to help calm her down and clean everywhere that she’s had an accident with Nature’s Miracle. Then slowly start to increase her space. If you need more help, I offer a variety of different services over email or phone to help you get your cat back on track. Since your cat has been doing this for a while, I’d also get a vet checkup. Finally, you might want to try offering a variety of litter boxes and litter types. That often helps! My cat is about 7 years old. She has always used the litter box before and hasn’t had problems. Recently she has been pooping everywhere around the house and we made sure her litter box was clean. What’s wrong with her? Hi, Bri! So sorry about the litterbox issues, I know they’re a huge pain. I’d start by confining your kitty to a smaller space (like a bathroom). Use some Feliway to help calm her down and clean everywhere that she’s had an accident with Nature’s Miracle. Then slowly start to increase her space. If you need more help, I offer a variety of different services over email or phone to help you get your cat back on track. Since your cat has been doing this for a while, I’d also get a vet checkup. Finally, you might want to try offering a variety of litter boxes and litter types. That often helps! My cat Gus has been pooping about 2 ft in front of his litter box. At first I thought I wasn’t cleaning it enough but even after cleaning it really good and adding arm and hammer to make his litter smell fresh that night he did it again! I don’t know what to do. One site I saw said that the litter box needs to be 1 1/2 times bigger than the cat’s length, and I’ve got a pretty big boy (he’s not fat just big and long, about 15lb) so I’m not sure where to get a larger one than the one we have. He’s 6 years old so he’s not old be any means…and he’s never had a problem like this aside from a time when he was pooping in a certain plant about 3 years ago. Hi Olivia! I’m sorry you’re struggling with this. Why don’t we hop on a 15 minute phone call to try to troubleshoot? Thanks for sharing Cosmo’s story! The only thing that I would add is that in mane cases, it is important to close the cat into a smaller room. A crate isn’t necessary, but a smaller space often is. And be sure to clean those spots! About a week ago I was taking care of my mother’s cat for a week and I had a put him down due an illness. Then suddenly my own house cat starts pooping on the floor twice in a week. One near his litterbox and in kitchen. Help. Hi, Mona. I’m so sorry that you’re dealing with so much at once! Why don’t we hop on a 15 minute phone call to try to troubleshoot? Hi I hope you can help. My British blue Lucy who is 12 years old. She has become our only cat a year ago which she loves. Unfortunately this has ment that neighborhood cats about 4 have invaded her territory. She was attacked about two weeks ago ( not hurt) which has shaken her badly. Since then she has taken to pooping under our dinner table her litter box is about 8 feet away. She will only go outside when we are with her. She has always tended to more indoors cat. I really hope you can help. Hi, Glenda. So sorry that your kitty is struggling. It sounds like the outdoor cats are posing a problem for her. She might prefer to just stay indoors for a while, especially as she gets older. I wonder if pooping under the table feels more secure for her right now. Is your litter box covered or uncovered? Hey I have been having a problem with my cat she has been pooping and peeing in the floor. We have 3cats,please help us!!!!!!!!!!!!! Hi there! So sorry to hear that you’re struggling. Let’s hop on the phone (15 minute call here) to get things solved for you! My female cat, about 9 years old, started defecating just outside of the litterbox when we adopted a kitten in late August. She wanders calmly next to the litterbox… and “goes.” I have 4 litterboxes, 3 cats (including her -14, 9 and 6 months) and we clean the boxes every day. I vacuum the floor and clean the area every day. Luckily, it’s linoleum. But I don’t know how to stop this behavior. I even caught her in the act and she did not stop! Kept going! She only urinates in the litter box, thankfully. I’m at a total loss! Hi Rachel! That sounds really frustrating. Let’s hop on the phone (15 minute call here) to get things solved for you! I unfortunately don’t have any suggestions beyond the ones listed in the article without asking a lot more questions! If we can talk one-on-one, I can give much better support. Chan, can you try confining the offending cat into a smaller space and/or adding extra litter boxes? It’s possible that your new kitten isn’t litter-trained yet. Reducing her space is more helpful than putting her in the tray! What litter do you recommend? Hi Agatha! World’s Best Litter is a go-to for me, but it kind of depends on the cat. Most cats prefer sandy-like litter, but that’s not a winner with ALL cats. Great article! My cat has been pooping just outside of her box. I’ve used Cat Attract, super cleaned her box, added another box, etc. and still nothing. Once in a while she’ll go in the box but not all the time. She’s a little over a year old and she had littler box problems when we first got her, but we used Cat Attract litter and she has been fine for 9 or 10 months. She is peeing in her box every time (which I prefer if I had to choose! ), just not pooping in the box. We play with her a lot and I work from home so she’s not left at home alone and we moved to a new home 2 months ago and she only has problems now so I don’t think that’s it. Overall shes been acting normal so I am baffled. When I called the vet, she said she thinks it behavioral because she’s had a checkup recently with a clean bill of health. Im concerned that if it becomes too much of a habit we’ll never get her to stop. I am not sure what else to try, any thoughts? I appreciate any insight, thanks so much! Hi Kami! It looks like you’ve done a great job with the first steps to fix things. With these more complex cases, it’s helpful to talk to an expert (like me). I offer 15-minute calls for $15, where we could really troubleshoot things. Otherwise, I’d also suggest reducing your cat’s space to see if that helps. How clean is the box? Where is the box? Where is she pooping? I’m sorry to hear that, Stacey! What a pain. Have you been able to follow the steps outlined in the article above, like increasing her daily playtime, restricting her space, going to the vet for a checkup, and thoroughly cleaning the accident areas? Hi Kelsey. I’m so sorry to hear that, I know how frustrating that is! What have you tried so far aside from cleaning the boxes? Did you follow the steps in the article above, like taking the cats to the vet or increasing enrichment? My 2 and a half year old, Seb, has been pooping on the floor next to the litter tray for months now. He used the tray again for a few weeks but now back to square one???? please please help. Hi Jemma. I’m so sorry to hear that, I know how frustrating that is! What have you tried so far? Did you follow the steps in the article above? Hi Ella. I’m so sorry to hear that, I know how frustrating that is! What have you tried so far to fix the problem? Did you follow the steps in the article above, like taking the cats to the vet or increasing enrichment? We got my daughters cat when he was 10 weeks old fully litter trained. He’s now 4 months old and today and yesterday he pooped on the floor. She cleans the box daily and plays with each day. Why would he start pooping on the floor? Hi Kristal. Unfortunately, I can’t tell you for sure without knowing a lot more about your household routine and your cat. If you’d like my help, you can purchase a 15 minute or one-hour phone call with me. My female cat has been pooping next to the litter boxes and in the hallway. We tried switching our litter we have one with scent and three without scent. I am at the end of my rope with her. Hi Mike! What else have you tried so far to help your cat? Has she been to the vet? Are you playing with her more? Hello. My cat has suddenly started popping on my bedroom floor at bed time. He’s never pooped on the floor but the last week he’s been doing it. He also has been peeing on the floor, only in my bedroom and at night. I thought maybe it was because my dog would kind of block him in my room, but tonight my dog was in bed with me and my cat still popped on the floor, and then scratched at the carpet like he does the litter box. He’s really making my room smell. I’ve used urine off and a pet floor shampoo and it still smells. He has had two urinary blocks in the past and is on a prescription diet now. I don’t know what to do and have been thinking of getting rid of him, but don’t want to pass the Burdon onto someone else especially because he loves me and doesn’t go to anyone else, but I’m at my wits end! Also if I leave clothes out him and my other cat will pee on them, they have been doing that for years if I leave clothes on the floor. Hi Alisha! Sounds like your cat’s litterbox problems are pretty serious. You’re off to the right start with the prescription diet and the deep-cleaning. Have you been able to try increasing his play time and reducing his stress other ways, like outlined above? Hi, my cat is almost 4 years old. Recently he started pooping right across the litter box that’s in our bathroom. He still pees inside, so I’m not sure what the issue is? It’s a covered litter box that he’s used well for a few months now if it helps. Hi, my boyfriend and I have a 6 month old kitten and she recently started pooping outside of the litter box. She was doing fine, then I gave her a Inaba Ciao grilled chicken treat and she got diarrhea from that. I understood why she pooped on the floor when that happened. However, she won’t stop pooping on the floor now. We put her in a room at night because she sleeps half of the night and then has major bursts of energy, naturally because she’s a kitten. We did this before and she was fine. Used the litter and all. Now we wake up and open the door to a few piles here and there. I watched her use her litter the other night and she started to poop but as soon as it started coming out, she jumped out and started scooting. Any ideas? I plan on bringing her to the vet, but just wanted to know if anyone knew why she might be doing this. I think the vet is a great first step! The scooting behavior is odd, it seems to indicate pain to me. Let us know what the vet says! Hi, my 9 year old female cat started pooping outside her box about a month ago. She shares a box with another male cat. The interesting thing is that she poops near the litter box and always in the same spot, but she always goes to pee in the box. I tried covering up the spot but she still left a present near that spot. Then I tried putting another litter box, but still nothing changed. The litter is unscented and I haven’t changed the brand in years and I clean the box twice a day. Do you have any ideas? Thank you in advance for any help. That’s interesting, Gabriela! 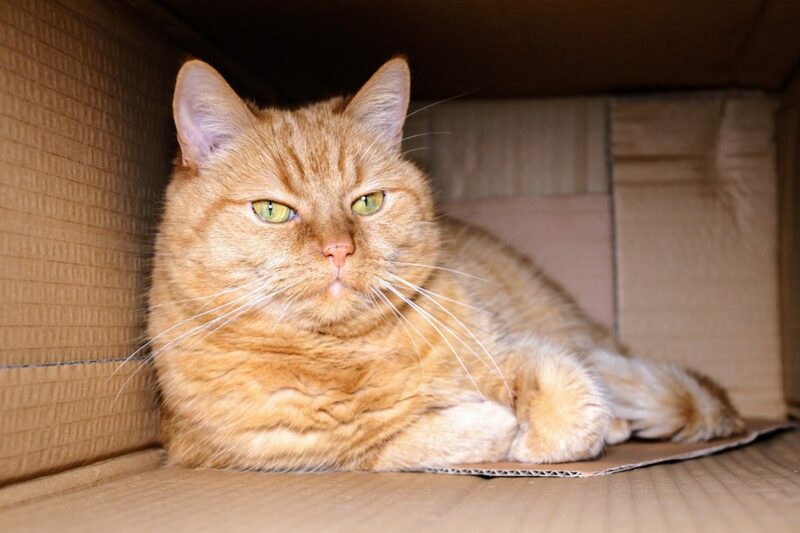 Try adding another box near where she currently is leaving presents – some cats prefer not to poop where they pee!